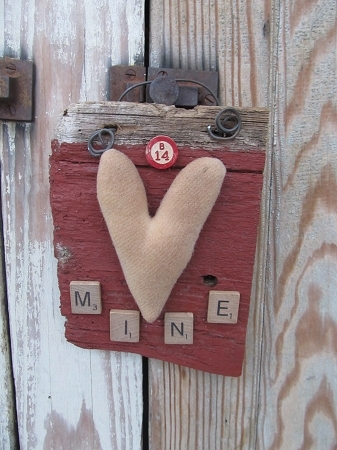 Primitive Rustic Valentine Barn Board Hanger with Tan Heart B14 Mine. My Mom was going to town playing in her craft room and came up with this adorable Valentine's Day one of a kind. Rustic natural red painted barn board scrap with a hand sewn wool heart in tan. She found these neat old wooden game board pieces, this one from a Bingo set. B14. Then she completed the phrase MINE with some old scrabble letters. Wire hanger. Size is 7 1/4" x 4 3/4". Hand made by Lynn. Only 1 in stock!